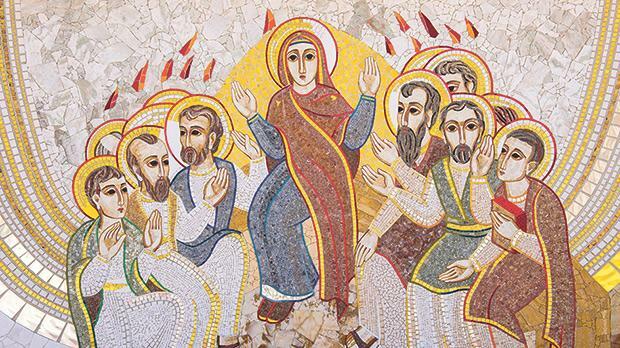 One of the mosaics lining the parvis at Ta’ Pinu sanctuary, Għarb, showing the Holy Spirit descending as tongues of fire on Mary and the Apostles. For this year’s International Women’s Day, the Faculty of Theology organised a celebratory seminar to mark the contributions of women in theology. This made me pause and reflect, not just on the vocation of women in the Church, but on the distinctive contribution of theologians. Theologians are an ambiguous breed, working invisibly and navigating in in-between spaces: between academia and the Church; between the secular and the spiritual; between the intellectual and holistic human formation; between the ecclesiastical hierarchy and the people of God. As women theologians we are also expected to navigate another ill-defined space: that of carving a distinctly ‘female’ voice in the Church. How do we do it all? The space between the university and the Church might be an accident of history, but it demands of the theologian that we learn new languages to bridge the long Catholic tradition of philosophical reflection with newer sciences and worldviews. This is not just a matter of ‘interdisciplinarity’: for the theologian it is a matter of intellectual honesty based on the conviction that every intelligent human pursuit – every science, every art – has something to teach all humankind and therefore must be amalgamated in the ongoing reflection on what it means to be human desiring transcendence. Likewise, we must be flexible enough to speak in different ‘tonalities’: while our primary intellectual focus might be the ineffable ‘spiritual’, we try to speak to a world of human affairs: to the reality of suffering; to our mutual responsibility in politics and ethics; to the myriad ways we cause violence to each other. To speak meaningfully on human affairs, theologians must enter all ‘existential’ horizons of meaning: religious or secular. We do so through trusting that while we are all human and desire a better life, we articulate that desire in unique ways. Hence, theology cannot be just an intellectual pursuit, as we are ultimately on a human journey. Theologians must embrace fully the vocation of teaching as mentoring. Our students come with many doubts and existential questions, with a desire to articulate a sense of ‘meaning’. For every student, this is a personal journey: unrepeatable and unique. Thus, ‘teaching theology’ implies trust in a dynamic of accompaniment fully cognisant of the fact that those we aim to form will themselves serve in lay and ordained ministry. But then, who are we, poor pilgrims on a journey, to accompany others along theirs? This is where the distinctive ‘title’ of theologian in the Church is in itself paradoxical. For, to be truly a ‘theologian’ worthy of the name is not something that can be reduced to doing, but rather to a state of being. What characterises the theologian is an attunement with the divine that no ‘qualification’ or ‘office’ can capture. Theology is done on one’s knees, as Balthasar evocatively put it. Thus, one cannot claim to be a theologian. Rather, the Church recognises a person as such, through a disposition to become a Spirit-filled presence, where one’s spiritual and intellectual life is directed to whatever the Spirit determines to be the need of the Church in that particular time and space. Thus, ‘female’ theologians are perhaps an even greater paradox. As women we cannot but speak in a ‘female’ voice – a voice that for some, still sounds strangely unfamiliar in the Church. But it is not our ‘female’ voice that really matters. It is rather how we offer ourselves, with all we are, for service in the Church: with no pretensions, but trusting that it is our faithful but distinctive presence that ultimately makes the real difference. Nadia Delicata is a lecturer at the University’s Faculty of Theology.